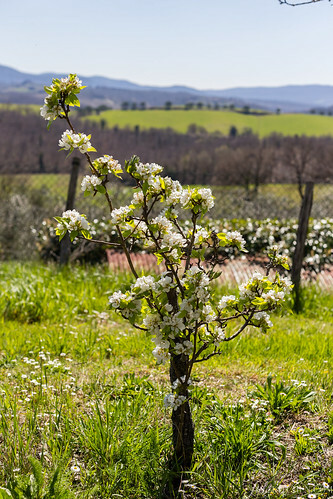 Home is here, in the Tuscan countryside. I am deeply rooted in this house that was built by my great-great-grandfather Tommaso in 1926, where my grandmother and my father grew up, where mum learnt to cook, to grow vegetables, to love over the time the country life, so different from the one she was used to as a girl in the village of San Gimignano. Every morning I open the windows on a soft landscape of woods and fields, scattered houses and stone villages. 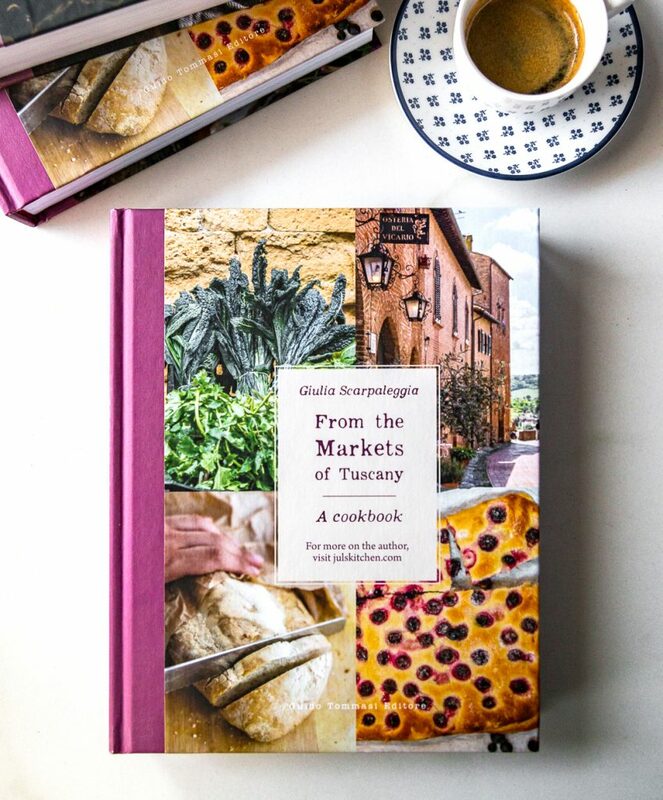 This is a powerful source of inspiration for my recipes. This landscape, these colours and all the related memories affect my way of being and the way I cook. I am a country girl who loves a traditional family-style cuisine. Then there is London. Nothing could be further from my daily life, and yet here I feel at home. I try to visit London quite often, but it’s been almost two years since the last time I was there. 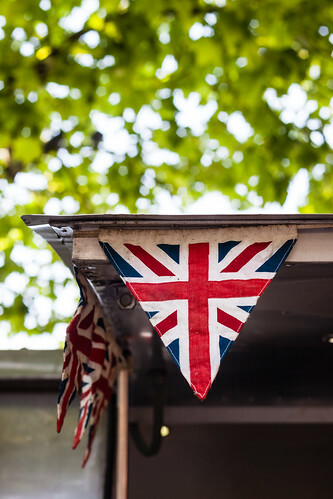 In London I realized that the dream of turning my blog into my daily work was more feasible than I thought. Here I’ve found valuable friends, the thrill of independence and exploration, the freedom to decide my destiny. In London I overcome my shyness. 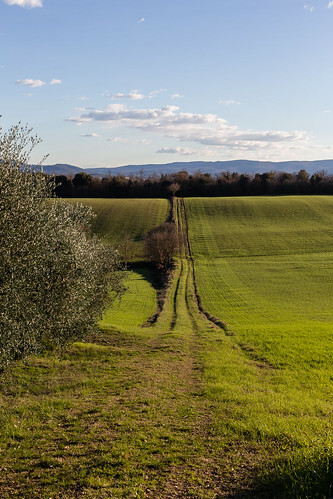 If the Tuscan countryside is my daily inspiration, London is a breath of fresh air, the sparkle that triggers new ideas, turns on projects and makes me more motivated. Finally I’ll back in London after nearly two years with Tommaso, I’ll hug again my dear friend Sarka, who contributed enormously to make my dreams come true. We will attend Regula‘s book launch for Pride and Pudding, being there for her during one of the most exciting days of her life. These four precious days will be useful to unwind, to pause for a second all the renovation works, my book final writings, cooking classes and unexpected family events. 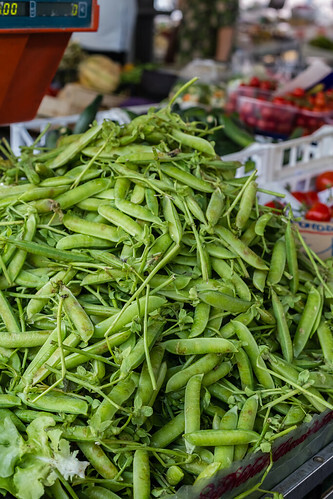 On the market stalls you spot the fresh peas from afar, the first sign that spring is coming. After fresh peas you’ll have sunny days, lighter fare, fresh flowers and country walks. 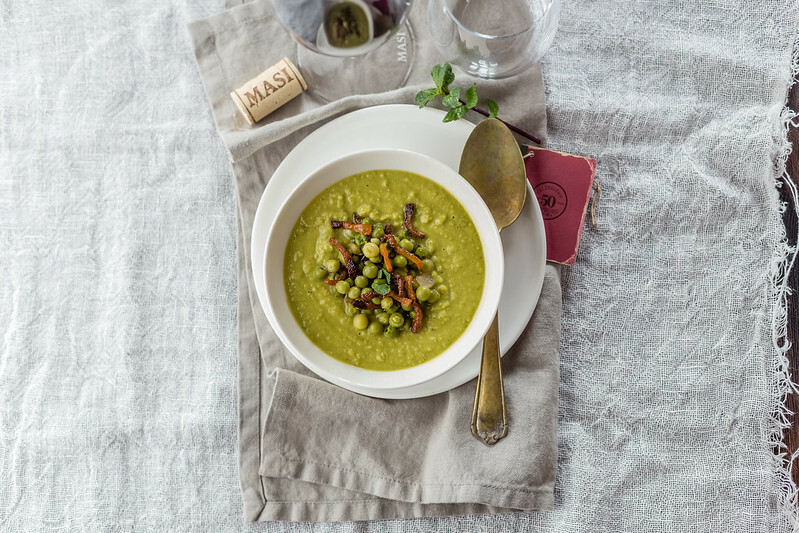 In Tuscany we eat fresh peas now, when you can also find the fresh garlic: piselli alla fiorentina, Florentine peas, are a classic seasonal side dish. They represent Florence and its love for well-cooked vegetables. Add a piece of bread to mop the juices that the peas will form while you stew them over low heat and you have almost a whole meal. 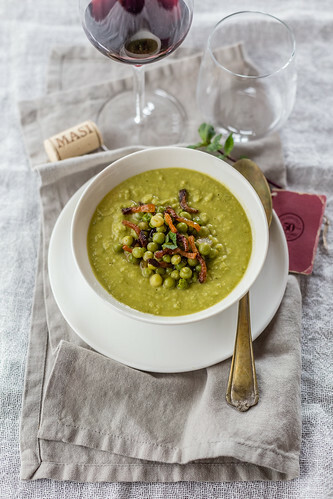 The British cuisine, on the other side, often combines the peas with mint, as in the ubiquitous English pea soup, a column of their culinary tradition. Two classics collide in today’s recipe, turning a Tuscan side dish into a delicate soup. Crush the garlic and add it into a saucepan with extra virgin olive oil and half of the pancetta, finely chopped. When the pancetta has almost melted, add the peas and let them cook for about 5 minutes, stirring often to mingle the flavours. Pour little by little the boiling water into the saucepan, add the tomato paste, then cook the peas on medium low heat for about 25-30 minutes, until they are soft. 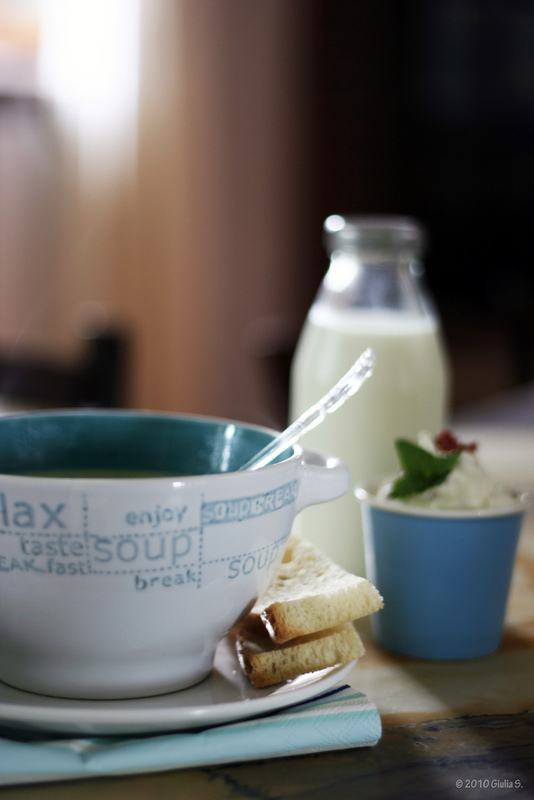 Set aside a few spoonfuls of peas, then season the soup with salt and pepper, add the mint leaves and blend the soup. Put it back on the heat and cook until it has the thickness you prefer. Cut the remaining pancetta into thin strips and brown them in a frying pan until crisp. 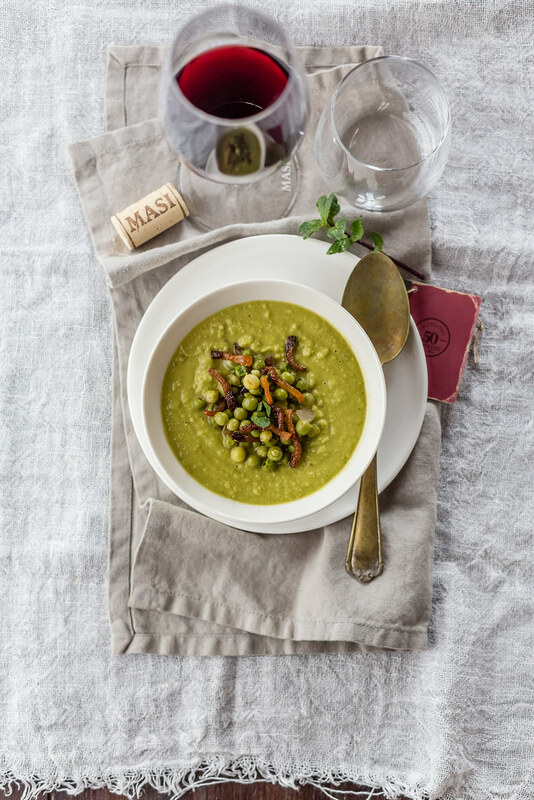 Scoop the soup into four bowls and decorate with the reserved peas and the crisp pancetta. * You can substitute pancetta with cured bacon. I will tell you everything about Pride and Pudding and Regula’s book launch, there will be the chance to talk about Florentine, Emiko’s new book, I’ll tell you more about my book, too, about the emotion of being in London again to be inspired and hopefully we’ll be able to show you the new Juls’ Kitchen studio: tiles are set down, walls are painted, we’re waiting for the kitchen and the stove to come! Lovely post Juls! I feel the same as you, but in reverse! London is my home (or was), yet so are the rolling hills of Tuscany from my time in Florence. Whenever I visit I feel as though I am back where I belong. Next time I come, I’d love to visit you and your family and see the new studio – your farm and that view from your garden is one of my favourite spots, not to mention how lovely you all are (and the food of course! :D). 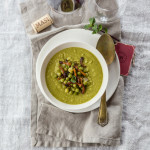 The perfect springtime soup! 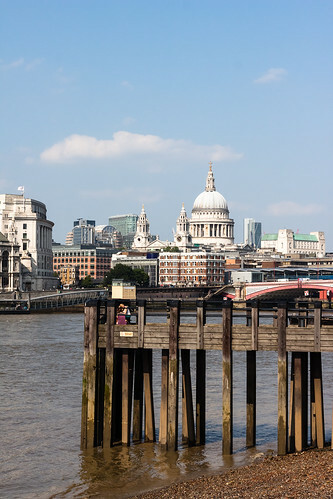 Enjoy your travels in London…. Pure spring on a plate! I would only throw in a splash of lemon juice. Just a touch of acid prevents oxidation (which leads to browning) from occurring. It helps to preserve vivid and bright green colour. Oh my gosh, you just gave me a reason to buy 2kg of peas! I adore how simple this is and how lovely, I am definitely going to make it for Nico as he is a man who loves his peas and no I want say that in Italian because you all of the fun double meanings with that one. Have fun in London! I definitely want to check out your friend’s book!